L'actor estatounitense Tyrone Power, en una imachen de 1946. Tyrone Power (nombre artistico de Tyrone Edmund Power, Jr.), naixito de Cincinnati (Ohio, Estatos Unitos) o 5 de mayo de 1914 y muerto en Madrit (Espanya) o 15 de noviembre de 1958, estió un actor estatounitense con una important carrera en o Cine estatounitense , destacando-ie cintas como The Mark of Zorro (Rouben Mamoulian, 1940), The Black Swan (Henry King, 1942), Captain from Castile (Henry King, 1947) u The Black Rose (Henry Hathaway, 1950). Se veigan as imáchens de Commons sobre Tyrone Power. (en) Tyrone Power en IMDb. 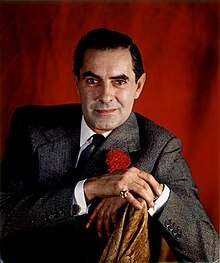 (en) Tyrone Power en Internet Broadway Database. (en) Tyrone Power en Find A Grave.